And as of last week it was about where we left off. 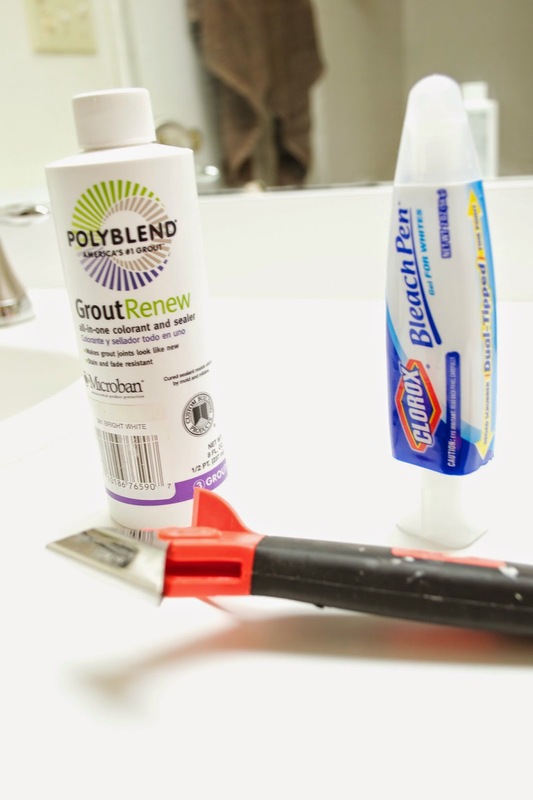 Shortly after failing at really rejuvenating our grout, I saw a few people post about Polyblend Grout Renew. I decided to pick up a bottle to try it out and proceeded to have it sit on our counter for the last six months. Well, in a renewed effort this week, I decided to attack the grout with a few new tools. Since I wasn't sure how well the caulk was actually protecting the seams, next, I went over everything with a bleach pen to kill any lingering grossness. Plus I figured it wouldn't hurt in the whitening department although it didn't really make a noticeable difference. I let that sit for a couple of hours and then cleaned everything really well. I let the bathroom dry (with a fan on it) overnight before the next step. This was the real time consuming part of the project. 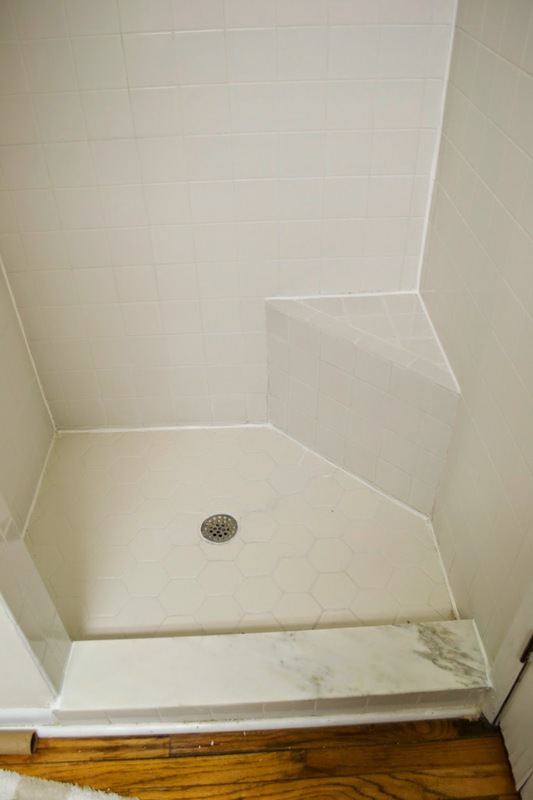 Our shower isn't that large but it still took a few hours on a couple of days to paint all the grout lines with Polyblend. 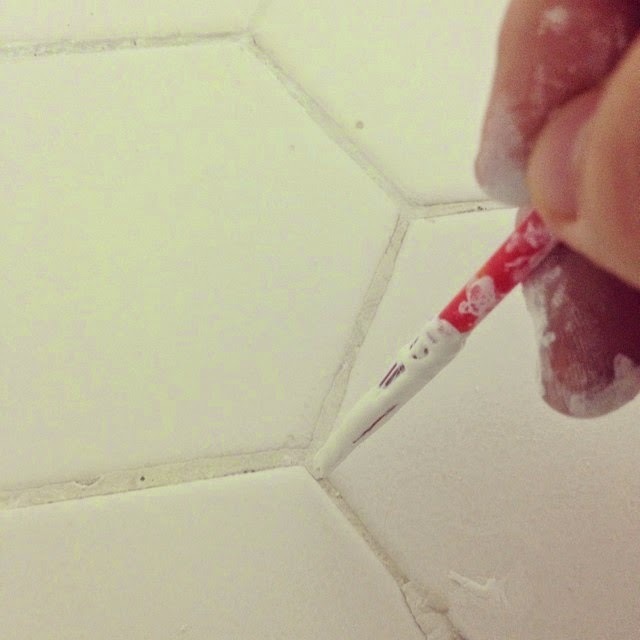 It said to use a toothbrush but my grout lines were too narrow so I used a small paintbrush. Our grout didn't seem like it was in the greatest of shape so I made sure to go over each line completely and a lot of lines required 3-4 layers before the were really sealed an white again. Even though this took awhile it was a big change when I was done. Then there were just a couple more things to do. 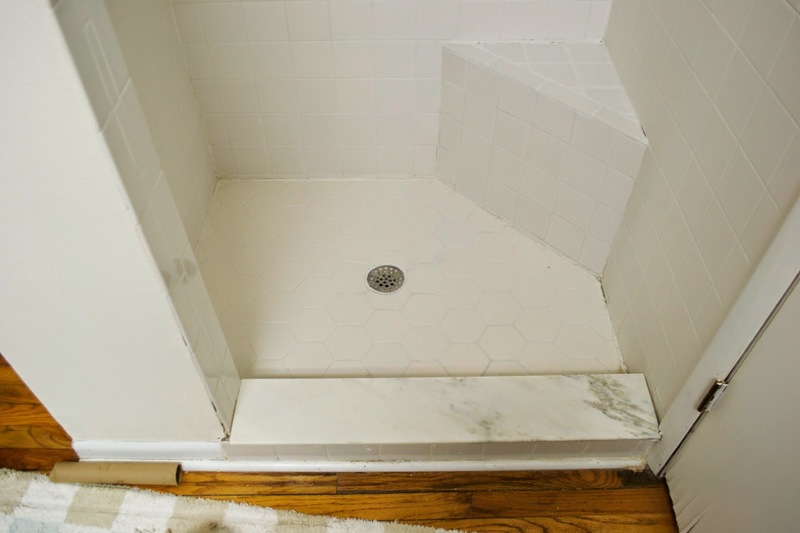 The marble threshold was broken in two pieces so Nate bought and trimmed down a new one and I popped the old one off, cleaned everything up, put down new adhesive and put the new piece of marble down. Then I caulked all of the seams. 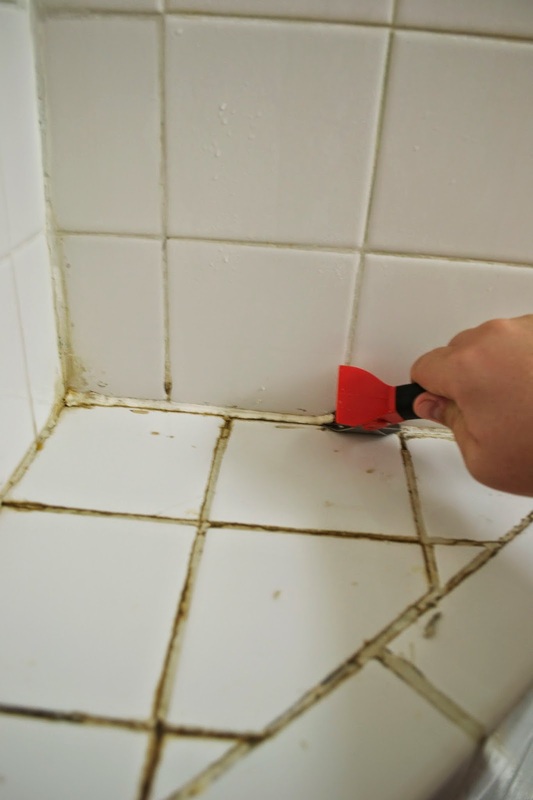 We used a special mildew resistant caulk and it was much thicker and stickier than normal caulk and I really like how it smoothed out so there aren't any little nooks and crannies for mold and mildew to hide in. 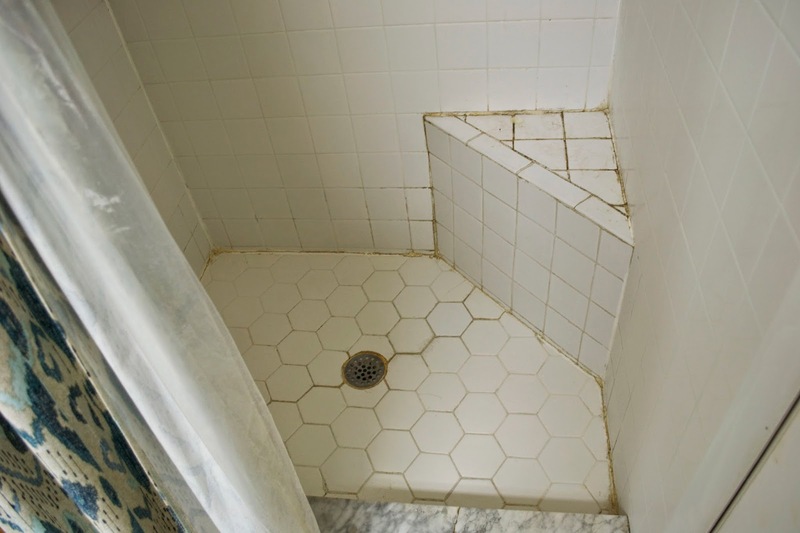 It's definitely a huge improvement but something that is now bugging me is that once the grout was white it became noticeable that the wall tile is white but the floor tile is a slight bisque color. It's more noticeable in person than in pictures but it definitely confirms our decision to eventually gut this bathroom. 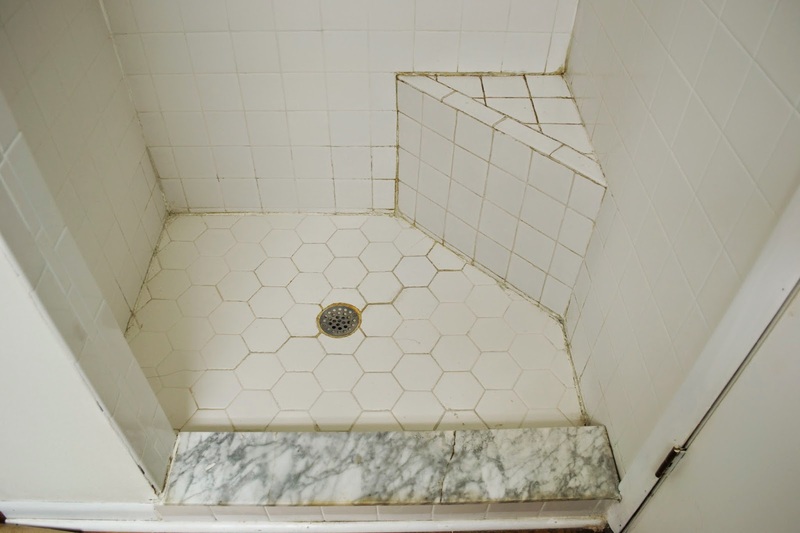 For now though, this is a much more pleasant place to shower. I mean, just take a look at the before, middle and after pics! Wow that made the world of a difference. It looks much better know and will probably be a lot easier to keep clean. I am pinning this to my Bathroom board. Great tips! What an amazing transformation. 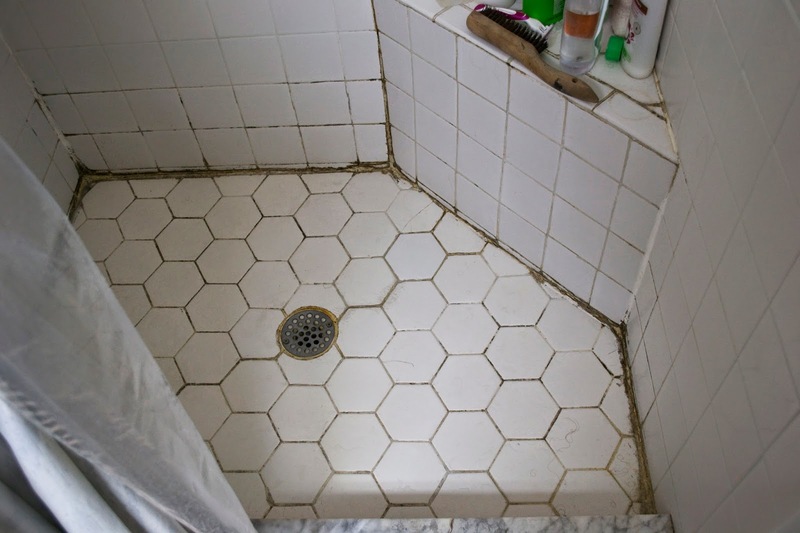 We have some old, gross grout too, and we will have to try and tackle this one day. It's always great to see someone else have success, and know that it's worth doing. 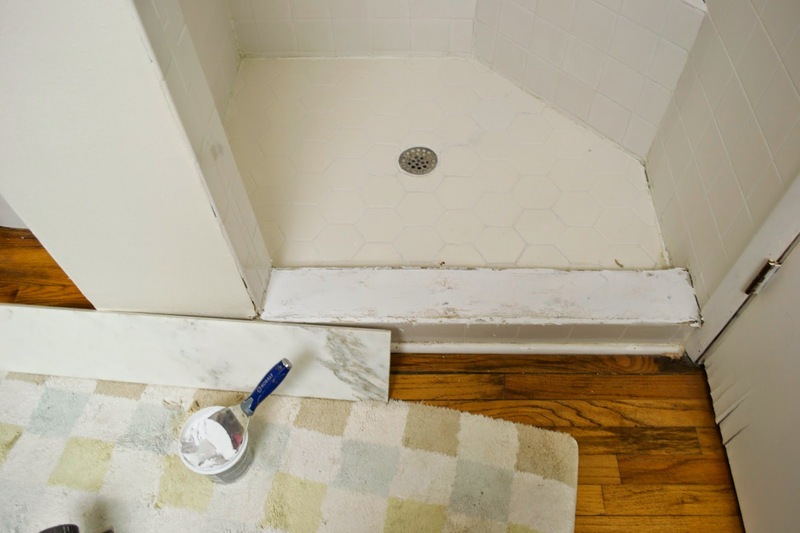 I'm so glad to see this works easily in the shower I too have nasty old grout and mildew issues!